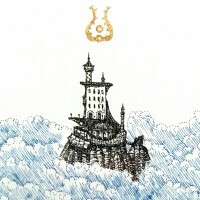 This picture started out as a rough ink sketch for my Cloud Top Archipelago project. A meeting with a publisher led me to quickly colour it in Photoshop and this is the result. The tower is the workshop home of Amaryn and her father. Hidden in the forest, it did not start life as a building. The top half of the tower is the hollowed out head and torso of a Colossus, a huge steam powered metal man. Amaryn’s father stole the Colossus and fled to the forest where he used its “muscle” to dig foundations, cannibalising its parts to build his workshop home.